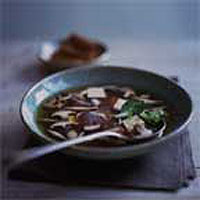 This is classic Chinese home-cooking, a clear broth fortified with tofu, sharpened with vinegar and flavoured with mushrooms - ideal at the end of a long day. If you don't like tofu, pour an egg white into the boiling broth just before serving, then stir with chopsticks to give delicate streaks of white. Put the stock in a pan and bring to the boil. Put the slice of ginger in a garlic press and squeeze out the juice into the stock. Add the tofu and mushrooms to the boiling stock, and simmer gently for 10 minutes. Stir in the soy sauce, vinegar and oil and bring back to the boil. Taste and add more soy sauce or vinegar if you like. Pull the leaves from the watercress and stir into the soup along with the chilli and spring onions. Ladle into bowls and serve immediately. This is delicious with spring rolls or crispy wontons.